Waterloo – Wilfrid Laurier University has introduced the Laurier Experience Record, an online tool that allows students to maintain a comprehensive, validated record of their curricular and co-curricular activities and the skills and competencies they’ve gained. The Experience Record, combined with the recently renamed Experiential Learning & Career Development Centre, reflects Laurier’s focus on students’ access to experiential learning. Over the course of their university degree, students can document all of their experiential learning activities in the experience record, including: co-op work terms; involvement with student government and campus clubs and associations; campus and community volunteer opportunities; non-credit certificates and programs; on-campus employment; community service-learning courses, where students apply classroom learning through engagement with local organizations; and workplace projects and activities. Experiential learning takes place when students apply knowledge and skills in workplace contexts inside and outside the classroom. These opportunities require preparation before the programming, and guided reflection on the impact of these experiences on their personal and professional growth. As part of the recommendations of the 2016 Ontario Premier’s Highly Skilled Workforce Expert Panel, each graduating student should have engaged in an experiential learning opportunity by the end of their postsecondary program. Laurier’s framework provides multiple entry points for students throughout their studies. With an emphasis on skill development and student reflection, the Laurier Experience Record gives students a complete record of the competencies and experiences they have acquired to use when preparing for their job search and applying for jobs or graduate school. The experience record also allows the university to measure engagement in different experiential activities to inform experiential learning and career development programming initiatives. The Laurier Experience Record expands on the university’s co-curricular record, which was the first of its kind in the country when Laurier introduced it in 2003. 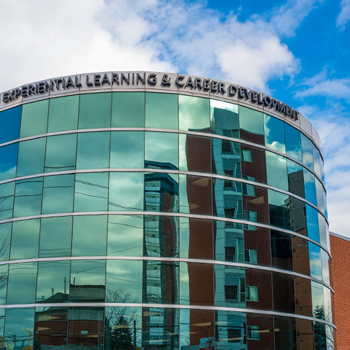 Laurier’s emphasis on the link between experiential learning and developing the essential skills identified by employers is reinforced by Laurier’s renamed Experiential Learning & Career Development Centre at the corner of King and Lodge streets on Laurier’s Waterloo campus. The university will soon launch a new building for community and workplace partnerships beside the existing facility.